An amide is a functional group containing a carbonyl group linked to a nitrogen atom or any compound containing the amide functional group. Amides are derived from carboxylic acid and an amine. 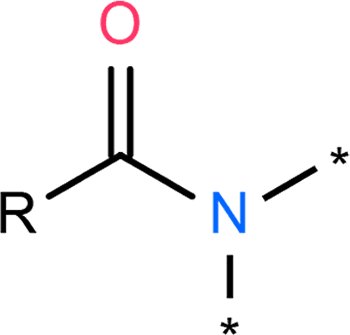 Amide is also the name for the inorganic anion NH2. It is the conjugate base of ammonia (NH3). Examples of amides include carboxamides, sulfonamides, and phosphoramides. Nylon is a polyamide. Several drugs are amides, including LCD, penicillin, and paracetamol. Amides may be used to form resilient structural materials (e.g., nylon, Kevlar). Dimethylformamide is an important organic solvent. Plants produce amides for a variety of functions. Amides are found in many drugs. March, Jerry (2013). Advanced Organic Chemistry, Reactions, Mechanisms and Structure (7th ed.). Wiley. ISBN 978-0470462591. Monson, Richard (1971). Advanced Organic Synthesis: Methods and Techniques. Academic Press. ISBN 978-0124336803.